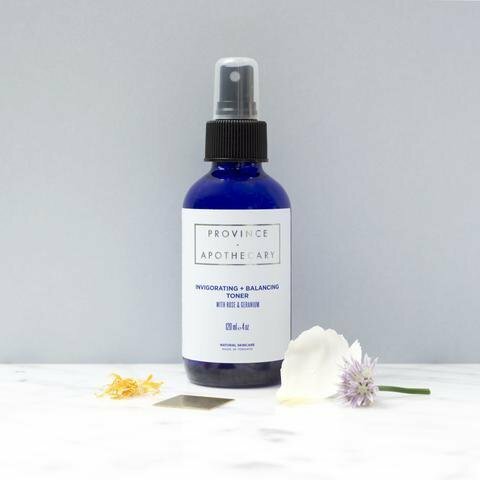 Invigorating + Balancing Toner with Rose & Geranium is great for normal, combination, oily, and congested skin. Natural minerals and nutrients combine to purify and tone your skin. Fragrant Organic Rose Water is naturally soothing and cooling to the skin, while Geranium essential oil calms and naturally reduces the appearance of scars. Directions: Use after cleansing. Apply 1-3 sprays of toner directly to your skin. Air-dry for 1-2 minutes. For best results, follow with Province Apothecary serum and moisturizer. We suggest using this toner when your skin is acting up. When blemishes first appear, spray toner directly on the blemished area twice a day.